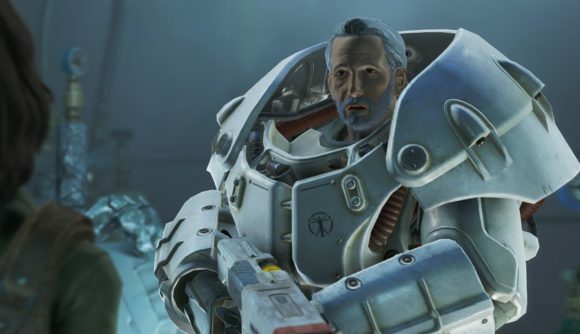 Fallout 4 launched in 2015, which I think means the statute of limitations on spoilers is up. Just in case, this is a story about a Fallout 4 mod which changes the ending and the ultimate fate of the most significant NPC in the game. The main quest sees you going in search of your missing son, Shaun, and the Father Companion mod offers a host of new ways to change his fate. You eventually find Shaun as the Father at the head of the mysterious Institute, and in the vanilla game his story ends as he succumbs to an advanced form of cancer. Father Companion lets you cure that cancer – either in a straightforward way or by turning your son into a super mutant – and as the name suggests it also allows you to travel with Father after the ending plays out. The mod, available on the Nexus, has been around for several months, but it just got a major new patch which adds new ending cinematics, additional ending options, new rewards, and new reactions from the rest of your travelling companions. With this update’s release, modder ToroMontana says that this is more or less “the final version of the mod.” So now’s a great time to jump in. You can get a taste of what to expect from the trailer above. It turns out that all it takes to conquer death and disease is a dedicated modder, and a willingness to indulge in experimental science-fiction technology. Who knew?